In October 1945 Vivian and Edgar traveled through New Mexico on a long delayed honeymoon; they had been married in April 1943 just before Edgar deployed to Ireland in advance of the invasion of Germany in June 1944. Vivian wrote home to her widowed mother describing the wonderful time she and Edgar were having and regretted having the trip come to an end. The bunch playing baseball one Sunday at mother's home. Pictured shortly after her marriage to John Edgar Scott in April 1943. The picture of Edgar & Vivian is dated 23 April 1943, 10 days after their marriage ceremony. Since Edgar would soon to deploy for training as part of the European invasion force, they were forced to hold off on a honeymoon until October 1945 - a nearby postcard sent by Vivian towards the end of the honeymoon relays her reluctance to be returning home to Texas - and to work. Their marriage was an improbable success; they were married six days after meeting, yet, their wonderful marriage endured until Edgar's death in 1986.
on the same day that the nearby family photo was taken at the Maresh Studios. The photo was probably taken at about the same time her husband, John Edgar Scott, had his nearby photo taken at the 2nd Infantry Division studio at Fort Sam Houston, Texas. The photos quite likely became "exchange" photos. A copy of this one may well have been stuffed inside his steel pot (helmet) while he was overseas with the 2ID during WWII. Quire likely a photo sent to her husband, John Edgar Scott, while he was deployed to Ireland/England - shortly after they married. Vivian is shown in pleasant weather outside their quarters before the arrival of Veeta in late November. Edgar is shown two months later in the same general postion - weather still fine. Edgar and his wife Vivian are shown on the steps of his sister's home in Dallas. Vivian was pregnant (PG) with Veeta. John Edgar and Vivian are in the right side of a photo was developed by Studer's in San Antonio, TX. Other persons are not yet identified. with John (Johnny) Pope, his wife Jean Howard and their daughter, Victoria (Vicky) Jean. with his wife Beulah during their 40th wedding anniversary celebration in Lytle (Old Frio City Road). 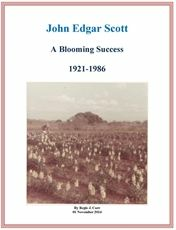 Several photos of flowers grown on the farm owner and managed by John Edgar and Vivian Scott between 1961 and 1986. Their daughter, Lana, found the item in their cedar blanket chest after they both died. This is the marriage license for John Edgar Scott & Vivian Howard. The license was granted on 12 April 1943 and the ceremony was conducted the following day by Rev. John L. Hyde in Kaufman County, TX. Vivian wrote a postcard from Albuquerque, NM to her mother, Minnie Bertha in Arlington TX, saying: "Only a few days left before I have to return to work. How I hate to have had such a nice honeymoon coming home Friday. Will probably stop by Friday. Will tell you all about it." Vivian's report of birth was prepared in Dec 1941, 19 years after her birth. Message: "Arrived safely expect to see you soon dont attempt to contact or write me here love. John.."
Her middle name was spelled with two "l" vice one "l" as found on her birth certificate. [S378] 1940 United States Federal Census, Database online. Year: 1940; Census Place: , Tarrant, Texas; Roll: T627_4141; Page: 9A; Enumeration District: 220-17. [S110] Family Tree - Leverett-Elton-Kennedy.FTW. 113: m. 1. 26 Jun 1939 Mary Lou Nicholson, divc 1953.